Adax SEG+ is a complete Security Gateway product for 3G and 4G wireless networks in a fully integrated 1U or 2U appliance that secures the connection between untrusted networks and the core. With up to 80Gbps of IPsec traffic the Adax SEG+ delivers performance, reliability and scalability in a complete, carrier-grade, Security Gateway solution. The on- board switch provides up to 16 x 1G or 4 x 10G interfaces to the network and dual 10G or dual 40G connectivity to the core without the need for an extra switch blade or module. High-Availability solutions are also available were system or network interface redundancy is required. The Adax SEG+ enables standards-compliant authentication, confidentiality and data integrity, and with hundreds of proven IPsec implementations Adax provides the advanced levels of protection, reliability, and performance mandated by OEM customers, MNOs and MVNOs. Adax SEG+ implements the most current IPsec security features including MOBIKE, IKEv2, TCP/IP firewall, IPv6/IPv4 support, and 64-bit platform support. Pre-integration with the Cavium Octeon II high-speed security processors on the Adax APR2 and Pkt2 blades and boards provides the hardware acceleration essential for performance-critical security algorithms and protocols. The integrated solution of the Adax APR2 and Pkt2-AMCs in a complete 1U or 2U system delivers the perfect Security Gateway appliance. Multiple 1G or 10G interfaces and dual 10G or 40G connectivity to the core is built in with the on-board switch. 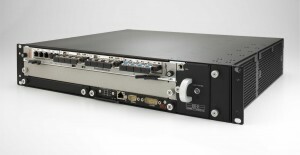 The aggregation of multiple 1G or 10G network interfaces in to the 40G connectivity to the core simplifies network configuration and management without the need for an extra switch blade or module. Remote monitoring and management is also included using a simplified shelf manager for temperature and fan control. The result is excellent system performance and unparalleled ease of network integration at a significantly lower price point.